All DVD tributes are personalized for you. A media professional will work with you to add any additional information to create the DVD Tribute. 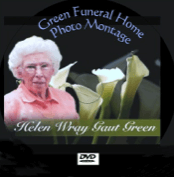 All DVD Tributes are included on all full visitation services. We will capture you Military Burial with multiple cameras and digital audio. You will hear every spoken word. This is an amazing tribute and a “must have"
this is a must have video to capture the eulogy and those who speak. spoken word for a lifetime of memories to be handed down to you children.